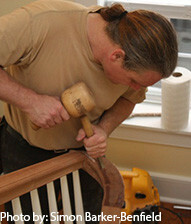 Fox Woodworking, LLC is dedicated to producing the finest custom cabinetry and architectural millwork. For over fifteen years, we have been producing exquisite and unique cabinetry for our discerning clients. We are equally comfortable working with contractors, designers, and homeowners. We are confident that, once you have worked with us, you will return to us for all of your custom cabinetry and millwork needs. Fox Woodworking, LLC is a small cabinetmaking and architectural millwork company with a dedicated and hard-working staff. We have built our business on the quality of our work and our many satisfied clients. We have worked on clients' first homes, second homes, and vacation homes. We build relationships as well as great cabinetry. Our fully equipped shop allows us to meet the most demanding client's needs. Meanwhile, in the office, we utilize the latest design software to fully plan all of a project's details and present crisp, clean drawings to our clients. By applying this simple philosophy and listening to our clients, we never fail to meet and even exceed their expectations.